This is a rare massive heavy main engine cog with shaft through the middle which sat behind the propeller blades at the hart of one of the engines .The part is in nice solid condition and does not have any real damage from the impact of the crash it still has a lot of its original colours and still has dirt and grime from the inside of the engine it has been cut away from the engine at one end and it has some part numbers that can be seen.The cog is very heavy and is 13 inches wide and stands 13 inches tall and is a cracking condition relic perfect for display. The part comes from RAF Halifax bomber LW280 crashed on weapons drop to French resistance on the 17th December 1943.The item comes with a A5 laminated information sheet and is a very rare large and rare bit of engine of RAF Halifax bomber . RAF Halifax bomber LW280 code NF-K of 138 Special Operations Executive Squadron crashed on weapons drop to French resistance on the 17th December 1943. The plane of 138 Squadron based at RAF Tempsford, Bedfordshire. A Squadron that was assigned to “Special Operations Executive” or SOE as it was known which carried out the delivery of agents, and the retrieval of agents to and from France as well as supply drops to the Resistance or Marquis freedom fighters in occupied Europe. 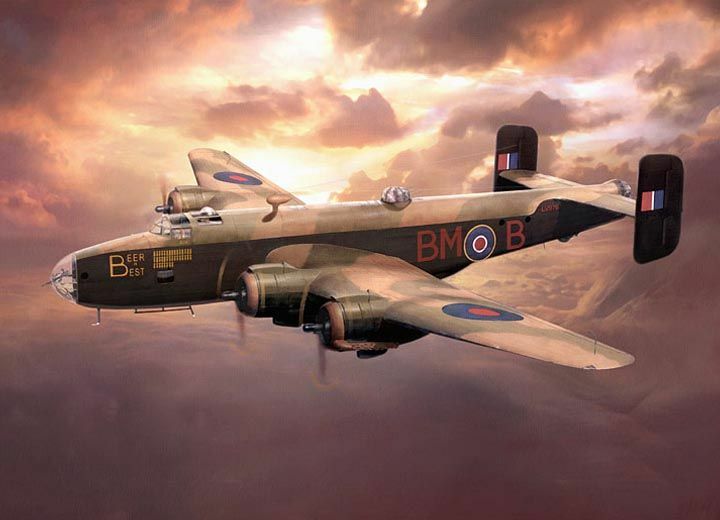 The Halifax for took off from RAF Tempsford bound for France at 20:05 hrs on what transpired to have been an abortive supply dropping mission to France, code named ‘Operation Marc 1 it was returning with its cargo of arms and munitions, when it hit bad weather over East Anglia.Now running short of fuel the Halifax’s pilot, Flight sergeant T.M. Thomas, gave the order for his crew to bale out. At approximately 05.45 hrs at Hale Fleet a mile south of half a mile south of Penny Hole Flats, and not far from Halliard Way, Tollesbury, Essex. The pilot Flight sargeant. T.M. Thomas was picked up safe also Sergeants J.A.Vick and J.K.K. Vincent were also found safe in the water but sadly Sergeants T.B.Hawkes, 21 year old Flight Engineer, J. Lynch, 20 year old Navigator, R. Marshall, 31 year old Bomb Aimer, and J.J. Hannah, 20 year old Wireless Operator/ Air Gunner, were all killed On the night of the 16/17th December 1943, a night that would live in the annuals of Bomber Command history forever, RAF Bomber Command was to lose 67 aircraft in total 57 Lancasters on Berlin raid ,3 Short Stirlings at Gardening and 7 Handley Page Halifax’s from 138 X1D SOE Operation shot down Luftwaffe night fighters or flak and some to the weather, rain, wind and fog bound airfields. Below 2 photos of the one in front of this Halifax bomber.